We all dream of a stress free life but we have busy lives. It’s no surprise that life can get a bit too much for some of us. It’s easy for the pressure life puts on us to leave us feeling stressed out but we must make sure we deal with this in a healthy way. Stress can be caused by a number of factors. Work, family, relationship, and financial problems are all common triggers. Big life changes can also cause stress. For example, buying a house, getting married, or losing a loved one. It’s important that we learn to manage stress as it can be very serious when stress gets out of control. Stress can affect us in many ways. It can make us feel overwhelmed, irritable, and scared. It can also change the way we feel about ourselves causing poor self esteem and low mood. Stress may cause us to worry constantly, cause poor concentration, and decision making problems. It may cause sleep issues which can lead to fatigue and an inability to cope throughout the day. Feeling stressed out can also affect us physically, causing headaches, nausea and dizziness. This can lead to poor appetite. Muscle tension and pain may also be experienced. This post may contain affiliate links, if you click on a link and make a purchase I may receive a small commission at no extra cost to you. A little stress from time to time is a normal part of life, but when things get too much it is very important to reduce stress as much as possible. 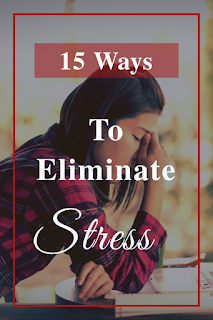 Here are 15 simple stress management strategies to help you work towards becoming stress free. When you start to feel stressed take 5 minutes and breathe deeply. Really concentrate on your breathing. This will help reduce stress hormones and lower heart rate and blood pressure. Try a simple relaxation technique like the ones listed here. If you have 30 minutes free, take a walk. The fresh air helps to relax the mind. Walking can increase endorphins which will reduce stress hormones. It will also boost your energy and reduce fatigue. It’s so important to get a good nights sleep. This will help to reduce stress and fatigue. It will also help to improve concentration and cognitive function. The more sleep we have, the more energy we have to help us deal with the stresses of the day. If you have problems falling asleep, take a look at my tips to get a good nights sleep . All of these things may trick you into thinking that you need them in times of stress. They may actually make you feel better for a short while. The truth is that they can all contribute to stress. Caffeine and nicotine are both stimulants and can only make things worse. Although alcohol is a depressive and will calm you down in the short term, in the long run it will only contribute to feelings of anxiety. This will make stress harder to deal with. Here are some tips on how to reduce caffeine. For a quick, easy, and free way to help combat stress drink a glass of water. If we don’t drink enough water there is a risk of being dehydrated which is known to cause stress. Dehydration can cause stress hormone levels to rise. It’s recommended that we drink 2 to 3 litres of water per day. When stressed we crave foods that are very high in sugar and fat. This can lead to health issues and weight gain which of course will lead to more stress. Reduce your intake of unhealthy foods and increase the amount of foods that are known to relieve stress. Laughter is a great way to reduce stress. It can greatly reduce the physical symptoms of stress. Laughter increases your intake of oxygen, stimulating your heart and lungs, and increasing endorphins. Laughter can also stimulate circulation and aid muscle relaxation. It makes difficult situations easier to cope with, connects you with other people and improves your mood. Listening to soothing music can reduce heart rate, blood pressure and stress. It can instantly relax you and calm your mind. Ultimate Relaxation Playlist the next time you are feeling stressed. You know how the old saying goes! Sharing what’s troubling you with others can be a great relief and can reduce stress greatly. The support of our loved ones is so important and it is never healthy to keep things bottled up. Although they may not be able to solve your problems, just talking about it can sometimes be enough to clear your mind and enable you to see a way forward. Yoga is a mind body practice combining physical poses, controlled breathing and meditation. It can help lower blood pressure and heart rate, and reduces stress. Yoga has many styles and difficulty levels, meaning it’s accessible for almost everyone. Hatha yoga is especially good for dealing with stress. It is slower paced and focuses on individual poses, combined with controlled breathing. Mindfulness is a simple form of meditation that brings our attention to the present moment. It focuses on breathing and full body scans which directs attention to particular areas of the body and sensations that can be felt. By focusing on the here and now we are less likely to worry about the future or regret the past. Mindfulness may reduce stress, improve sleep and help lower blood pressure. A disorganised world can create stress. Organising your day can bring a sense of control over your life which will reduce stress. Be sure to check out my post on the best planners for organisation. Whether you’re the glass half empty or half full type can affect your stress levels. Negative thoughts can activate a stress response but having an optimistic mind can reduce stress, give you better coping skills and improve your overall wellbeing. Positive thinking is not about sticking your head in the sand and ignoring your problems but about dealing with them in a positive and healthy way. The first step is to change your automatic thought processes from negative to positive and to focus on the best possible outcome not the worst. It’s always easier to say yes, but taking on too much can result in loss of control. In turn this can lead to stress, which may cause you to get run down and possibly sick. If you are worried that you will cause offence by saying no, just remember that if you are honest and respectful people will understand. It is so much better to devote more time and energy to 5 projects than spread yourself thinly working on 10. It’s a fact of life that we can’t control everything. Some things are just out of our hands. Accepting this and not wasting time worrying about them will reduce stress greatly. You can’t control what other people do and how they feel but you can have the best influence possible. If you think about the worst possible outcome I bet it’s not that bad. Know that you will get through it and move on to what you can change. Focus on the things that can be controlled and make realistic and positive choices. These are the tools that get me through stressful times. What do you do to help with stress management? The first step in managing stress is to understand where these feeling are coming from and then taking action on them. Good work Linsey Wigmore, I'll follow you. Stress blocks all energy mental and physical. Impressive post with useful tips on stress management. All great advise. I find yoga is my key to happiness. It provided me with tools to know how to handle situations that I might view as stressful and gave me tools to rewire thinking. These are really good tips for reducing stress. Things I need to be reminded of all too often. Thanks. Great article with some really practical advice. I especially like your last point, about accepting when things are out of our control and learning how to effectively deal with it- difficult, but crucial to eliminate stress. So simple but totally don't remember to do a lot of these. Thank you! Learning to say no is huge. I think that many times we commit to take on a task without really assessing how much work that could mean for us. This naturally causes friction. It's OK to say no, one doesn't have to commit to everything in life. We need some time to recharge. These are some fantastic tips. Some people fail to realize that drinking plenty of water is a great boost to your energy levels. Caffeine can make feelings of anxiety worse sometimes too. These are great stress reducers! Being positive makes a world of a difference plus healthy eating is a must but tough to do all them time but great post! Such a helpful list. We all experience stress from time to time. It's so important that we learn how to manage and eliminate it. After I was diagnosed with Graves Disease I had to learn how to manage and reduce stress for the sake of my wellbeing. And I've found that all of these things really help - healthy eating, walks, mindfulness meditation... and of course, saying no! Oh goodness that was a hard lesson to learn but such an important one :). Thanks for sharing, this is wonderful!